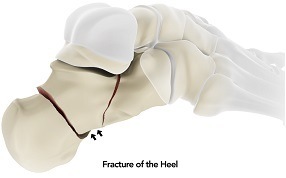 Calcaneal fractures are treated based on the type of fracture and extent of sof t tissue damage. Rest, ice, compression, and elevation (R.I.C.E.) is the most commonly used treatment option. Staying of f (resting) the injured foot can heal the fracture to a great extent. Covering the affected area with ice packs over a towel reduces swelling and pain. Compression stockings and elastic bandages can also aid in healing the pain. Positioning the feet above the level of heart reduces swelling. Immobilization by casting the injured foot prevents the fractured bone from moving. Walking with the help of crutches is advisable to avoid bearing body weight until healing has occurred. Open reduction and internal fixation involves putting the bone fragments back together with metal plates and screws to reposition them and set them to normal alignment. Percutaneous screw fixation is the best preferred treatment in cases where the bone pieces are large. The bone can either be pushed or pulled to set into place without making a large incision. Metal screws are then inserted and fixed through small incisions to hold the bone pieces together.